Home Secretary Charles Clarke has announced that anyone who doesn't volunteer to buy an ID card with their new passport will be charged more for the card when it becomes compulsory. Mr Clarke has been strung by the criticism he's received over the scheme and I guess now he believes it's payback time. John Lettice is on top form at the Register on ID cards again. "The Identity Cards Act finally (but one still hopes, temporarily) made it onto the statute book yesterday, and the Passport Service and all of its ultra vires identity-related activities (http://www.theregister.co.uk/2006/01/23/idcard_passport_roots/) will magically transform itself into the Identity and Passport Service tomorrow. We still don't accept that this is entirely legal, but phase one of the Government's incredible, improbable and unworkable joined-up border-watch, security and immigration policing system has now been given the Parliamentary green light, and immigration is one of the areas where it should bite first. So consider how it's supposed to work vis a vis immigration, and while doing so suspend disbelief...All that is needed is for the Government to claim that it's working; and claiming things are working when they are patently not is something of a special skill of this regime. The theory behind the system runs approximately as follows. Overseas visa applicants have their biometrics read as part of the application and can therefore be positively identified on entry to the country. Because their biometrics are on record, the chances of intercepting and deporting overstayers increases, at least in theory. Biometrics are also taken from new asylum applicants, so again they're on record and can theoretically be nicked and returned. Non-UK EU citizens will in the future have to have an ID card if they're resident in the UK for longer than three months; this one won't be in place for a while yet as compulsion can only be applied to them when it is also applied to UK citizens (EU law talking here), but it's an important aspect of the 'ring of steel' in that it provides a means of differentiation between say, Underpaid Polish cockle-picking EU citizens (good) and underpaid Ukrainian cockle-picking non-EU citizens (bad)." Highly recommemded. As is the series of reports by the Guardian's Felicity Lawrence mentioned by Lettice at the end of his piece. Glynn Moody reports that Google are the unlikely winners of a biopiracy award, in the category 'Biggest Threat to Genetic Privacy'. The US government and other usual suspects are cited under various awards but one I had not heard about was the 'Biggest Tiny Claim On Nature.' The site says the nanotechnology (chemistry) company Nanosys Inc. have a US patent on ‘metal-oxide nanorods’ (United States Patent Nos. 5897945, 5,997,832 and 6036774, if you're really interested) covering over a third of the elements in the periodic table. Though the US Patent Office list two of these patents (Nos. 5897945 and 6036774) under the names Lieber; Charles M. (Lexington, MA); Yang; Peidong (Somerville, MA) from Harvard University; and no. 5,997,832 under Lieber; Charles M. (Lexington, MA); Wong; Eric (Cambridge, MA). Professor Lieber is on Nanosys' Scientific Advisory Board but that doesn't mean he has assigned his patents to the company. The Apple v Apple case in the UK hinges on the court's interpretation of a latent ambiguity in the original agreement between the two companies. Apple Computer were allowed to use their logo for "...computer software of any kind on any medium..." and "data processing services, data transmission services..." and "ancillary services relating to... distribution." The Beatles Apple label are allowed to exlusively cover "any current or future creative works whose principal content is music and/or musical performances; regardless of the means by which those works are recorded, or communicated, whether tangible or intangible"
So they both have a justifiable claim. It's just that a service like iTunes wasn't anticipated when the two sets of lawyers hammered out an agreement circa 1991. It will be interesting to see which way the judgement falls. Agreeing that the controversial clause 35 in the Police and Justice Bill has now been improved by amendments, Spy blog nevertheless disapproves of the process of tagging clauses like barnacles to yet another a crime bill, illustrating a complete misunderstanding of the need to update the Computer Misuse Act for the internet age. "Kudos to Unity at Talk Politics and the Liberty Central website for bringing some small measure of sense to the attention of the Liberal Democrat Home Affairs spokesperson Lynne Feathersone, who tabled an Amendment during the Commons Committee stage consideration of the controversial Clause 35 of the Police and Justice Bill, which seeks to amend the obsolete, pre-internet Computer Misuse Act 1990. Unfortunately, as we predicted earlier the other inadequate amendments to the Computer Misuse Act went through "on the nod" with no debate. There should be a whole Bill devoted to Computer and Telecomms security, not just these three amendments tagged on to the much larger Police and Justice Bill." The US government have been urging the EU to be fair to Microsoft. "A memo written by unidentified government officials in Washington stated that Microsoft's complaints raise "substantial concerns" about the way Microsoft is being treated, according to a person close to the commission who spoke on the condition of anonymity because he was not authorized to discuss the memo. The memo was distributed this week through embassies in Europe and through the United States mission to the European Union in Brussels." Can it really be nearly six years since Judge Jackson ordered the break up of Microsoft at the request of ...er...oh yeah...the US government? No one ever really believed the break up would take place but by comparison a 2 million Euro a day fine, until they comply with the EU ruling, seems like a relatively small sanction. Update: Meanwhile Microsoft's competitors are whispering in EU ears that the tech giant should be clobbered. The eBay v MercExchange patent case was heard by the US Supreme Court this week. MercExchange is an online retailer and patent holding company. People familiar with eBay will know that if you pull up a web page with an item you're interested in, it sometimes includes a "buy now" button which you can click on to say you're happy to pay the price on the seller's price label, instead of getting involved in an auction. Amongst other things MercExchange have a patent for the electronic 'buy now' business method. Shurely you're joking Monsieur Corrigan? Nope. Digitise the obvious and you can get a patent on it. It's a function of the shock and awe that's visited upon society and its legal profession in the face of the magic that is computing technology. Then once the legal system gets its teeth into it, the farce takes on a life of its own. An arguably relatively internally-logical consistent farce, analysed in wonderful gut wrenching detail but still a farce of the order of the legal threats over copyright in silence. Jury awards $35 million damages. Judge reduces damages and refuses injunction since there'll be no harm done without it. Appeal Court says that's not a good test - i.e. that there'll be no harm done, even if business method patents like say one for a 'buy now' electronic button might be considered an idiotic idea - so there should be an injunction even if it could be harmful. So everyone rolls up to the incredibily busy, clever folks sitting on the Supreme Court and hence this week's hearing. You'd think they had more important things to be doing with their time. The trouble is a lot of money stands behind both sides in the dispute, with the big tech firms backing eBay (surprise, surprise) and the big pharmaceuticals backing MercExchange (surprise, surprise again). Update: Chief Justice Roberts was reportedly perplexed by the patents at the heart of the dispute. The MercExchange lawyer said he wasn't a software developer so couldn't explain the technicalities and "I have reason to believe neither is your honor." (Mmm I wouldn't have thought insulting the chief would be a particularly bright tactical manoeuvre?) Roberts accepted he wasn't a software expert but thought displaying pictures of goods to let people pick what they want didn't seem particularly innovative. Smart cookie. Don't get distracted by the flashy buttons and lights. This guy might turn out to have been a shrewd appointment. Further update: The final irony (for now) is that the US Patent Office told eBay 2 days before the Supreme Court hearing that they had finalised their decision to declare one of the MercExhange patents invalid. Tony Blair, Gordon Brown and David Blunkett (who started the whole shambles in the wake of the September 11th attacks) didn't show up for the final vote in the commons on the ID card system. Mr Blair hasn't got a great record of showing up for parliamentary votes. They get in the way of his busy job of running the country. Never mind. It won't be long until the Legislative and Regulatory Reform Bill passes into law and then he won't have to bother with parliament at all. It's rather a shame that House of Lords, which had been engaging in such a good rearguard action against the crazy scheme, should in the end 'compromise' on a technical rather than substantive question of compulsion. People applying for a passport can opt out of having the ID card but cannot opt out of having their details registered in the National Identity Register database. Since it is the database that is at the heart of many of the problems with the scheme, it essentially means that registration on the identity system is compulsory for UK citizens wanting a passport. "The only advantage to not having an ID Card if you apply for a Passport, between now and 2010, is that the provisions in the Bill which relate to notification of change of name or address details or changes to other data on the Register, only apply to people to whom an ID card has been issued (voluntarily or by compulsion)." I expect that will be quietly changed through secondary regulations or possibly even blatantly when the Legislative and Regulatory Reform Bill comes in. But this is where the French proposal overreaches. Rather than simply protecting the ability of other companies to interoperate with iTunes, by keeping their path free of legal barriers, the proposal would require Apple to take affirmative steps to help rivals interoperate. Imposing that obligation on Apple is not necessary, in my view. iTunes is not very complicated, so others should be able to figure out how to interoperate, for example by reverse engineering iTunes, as long as the law clearly allows them to do so. The disclosure obligation, though less onerous than critics say, won’t provide much extra benefit, so it’s not worth imposing its cost on Apple and others." Rebecca MacKinnon continues to criticise Yahoo! over their facilitation of human rights abuses in China. "Based on my conversations with people in the Chinese dot-com world, I get the impression that initially, they weren't thinking through the full implications of their business plans. But given that they are now doing nothing to help the families of the dissidents who are in jail thanks to Yahoo! 's cooperation with the Chinese police, and they are doing nothing to prevent more such convictions with Yahoo! 's assistance in the future (or the assistance of it's Chinese partner Alibaba under the Yahoo! brand), one must conclude they also don't actually care very much. If Yahoo's disingenuousness annoys you as much as it annoys me, Amnesty International has a letter writing campaign with all the addresses you need to let Jerry Yang and his colleagues know what you think. They have several recommendations for action which I have updated and modified below. Note: There is no mention here about disengagement with China. Jerry Yang, and other Yahoo! executives, please stop claiming that your critics are advocating disengagement. Most of us aren't. Stop treating the public and your (increasingly former) users like morons. It's really bad for business. You've certainly lost my trust." It seems that the government have this evening accepted Lord Armstrong's amendment to the ID card bill which would allow those applying for a passport to opt out of having an ID card. "The German justice minister has defended changes to German law which will increase sentences for consumers caught downloading copyrighted material to two years. Anyone caught downloading songs or films for commercial purposes could get up to five years in prison. The changes come into force on 1 January 2007." I wonder how long it will be before Warner Bros lawyers start hassling these guys. Some researchers have accused Russian leader Vladimir Putin of plagiarising his PhD thesis. Spy Blog has pointed out that the series of pilot schemes to test the proposed child information sharing index will be carried out without the informed consent of the data subjects i.e. the people whose details are being processed. "Reading the Draft Information Sharing Index (England) Regulations 2006, the only "safeguard" appears to be a 3 year Data Retention period. may be made notwithstanding any rule of common law which prohibits or restricts the disclosure of information. If the data is not being collected to "support measures or decisions with respect to that person", then why is it being collected centrally in the first place ? (b) in such a way that substantial damage or substantial distress is, or is likely to be, caused to that person. If the "damage or distress" is less than "substantial", then, according to this Draft Statutory Instrument, is it going to be permitted ? "The noble Baroness, Lady Morris, asked me whether the index satisfies the requirements of the Data Protection Act. We believe that it does. The full regulations and statutory guidance will clearly set out that all information on the index will be handled in a manner that is consistent with the Data Protection Act, and they will address issues of accuracy, retention, security and confidentiality." Baroness Sharp of Guildford: My Lords, I asked the Minister what access a parent will have to the index to check personal data. Lord Adonis: My Lords, I am afraid that I do not have the answer to that question to hand, but I will let the noble Baroness know as soon as I can after the debate. Note that Lord Adonis does not address the Data Protection Principle of informed consent. "Department of Health, Department for Education and Skills, Department for Work and Pensions and nine local authorities in England." "we have not considered it appropriate to conduct a public consultation." So the parents and children who are going to be used as guinea pigs for this "data matching" trial are not even going to be told whether or not that their personal data has been handed over to the contractor, without their informed consent !" It is at least worth asking the question as to why these proposals for a database to track every child and those officially connected with them have not received anything like the media attention associated with the ID card scheme. Especially since the government are making many of the same mistakes in relation to the design and deployment of this large information system as they are with the ID card scheme. I suspect it is largely because of the fear of ending up on the receiving end of empty but dangerous rhetoric of the "We're trying to protect children and you actually want to stop us doing that" variety. If the vast majority of people in this country are decent, then the vast majority of children are not in a situation where they are at risk in the sense of needing child support services (though those who do pose a risk to children still need to be kept away from them). Supporting children at risk is therefore not a problem that lends itself to data mining of the type planned. As Bruce Schneier says of these kinds of issues "it's a needle in a haystack problem and throwing more hay on the pile doesn't make that problem any easier." Improving communications between the various public services, like the police, schools, health and social services, that come into contact with children at risk is a very sensible goal. This grand plan for another big information system solution has lost sight of that basic idea. What a wonderful performance that was from Arsenal last night. The best I've seen in the Champions league since their 5-1 drubbing of Inter Milan in 2003 (when Edu and Parlour were playing in the middle). Fabregas and Henry will deservedly get the plaudits but every single member of the team played a vital part. Pires really impressed me in what was an unusual role for him, chasing and harrying, not something that you would have said before hand that he's have been too well suited to. I was a little concerned in the first half because I felt that there was a lot of energy being wasted and that they wouldn't be able to keep up the pace throughout. Though they'll be abused in the press for a poor quality performance, at that stage Juventus were still looking confident. Fabregas' goal on 40 minutes put a vital dent in Juve's swagger. Arsenal stepped up the pace even further in the second half, maintained that level right through to the end and completely overran the Italian league leaders. Well done again to Arsene Wenger and the team. Hopefully they'll complete the job just as confidently in Turin next week. Fabio Capello will know he's fortunate to be travelling home with a mere two goal deficit, though I suspect he will assign an old style Italian man-marker to Cesc Fabregas in an attempt to curb his creative instincts in the return leg. Bernard Lang, a prominent French computer scientist, has been in touch with Ed Felten about the much-discussed legislative developments in France. "One interesting fact is that this article 7 did not have most of these clauses when first voted during the debate. Then, on the last day (night ?) of the debate, after the last article, they reopened the debate on article 7 and voted the current version at 3h00 am. This was not a complete surprise, since it was known that several majority MPs were negotiating with the government. Interestingly, one purpose of this new IP right is to prey on cultural creation and creators by controlling the distribution channels, while pretending to offer what seems to be mostly an illusion of protection. The limitations of the French law just restrict technical measures to be what they are supposed to be: a protective device (for whatever it is worth), without giving any control to people other than the (rightful ?) rightowners of the work. I remember that, while some partners and I were being auditioned by government officials, their faces expressed surprise that we worried that artists should be able to publish their work, possibly protect their work, freely and without having to submit to the technology leveraged market control of a few large companies. My feeling was that no one else had expressed that concern before." Highly recommended and includes Lang's translation of the controversial clause 7 requiring drm to be interoperable. David Aaronovitch is pledging to fight the little Hitlers in coffee bars. "LAST WEEK my friend Walter had a citizen’s arrest effected upon him in a North London street by a coffee bar manager. Walter is a writer, middle-aged and of transparent honesty, and most certainly had not done what he was accused of — viz, half-inching a salmon sandwich from his local branch of this particular chain, and making a slow dash for freedom. The police were called, no sandwich was found, the coffee bar manager departed, without apology, to sulk among his sugar sachets. Walter is American and I had to explain to him why this had happened. It was a cold day and he was wearing a balaclava. To pub managers, coffee bar managers and other persons in debateable authority, headgear now suggests one thing only: a determination to thwart their CCTV systems. " Steve Mann has proposed a reciprocal to copyright. Legal development is sometimes said to be significantly more dilatory than technological development (notwithstanding our desire to state that “The trouble with law is that so many new laws are created so quickly that technology is having a hard time catching up.”). As society evolves, the original intent of old laws is often lost and they begin to be misapplied as a result. In some cases, after a significant amount of subtle, social evolution, the results can be egregious. It is therefore not very surprising that many Intellectual Property laws are now in conflict with the reasonable freedoms of scientific, scholarly, or academic pursuit." He and co-authors James Fung and Kyle Amon go on to outline the Felten DMCA and 2600 DeCSS cases and compare intellectual property to privacy. Basically he believes IP is out of control but that creating an equivalent property right in our own personal information and solitude could be a route towards protecting personal privacy in a digital age. "The effects of copyright, left, and center, tend to focus on protecting the interests of creators, producers, and distributors of information. We presented a reciprocal concept, namely that of Subjectright, that considers the rights of those who are exposed to informatic content, whether by choice, by accident, or against their will. We believe that especially when people are subject to informatic content against their will, that they have every right to “rip, mix, burn” or do what they like with it. Moreover, we also believe that any discussion of copyright is inherently unbalanced if it does not also consider subjectright." It's a bit difficult to get your head around at first but looking at something like this from a completely different perspective is often a good way to shed a light on the issues. "Apparently in an attempt to prove that no one reads end user license agreements (EULAs), anti-spyware firm PC Pitstop buried a note in its own EULA, saying they would give $1,000 to the first person who emailed them at a certain address. It only took four months and over 3,000 downloads before someone noticed it and sent an email (and got the $1,000)." James Love has been talking to the US trade representative about the US/Korea free trade agreement and intellectual property. "As noted in the 2006 Economic Report of the President, intellectual property rights can play an important role in creating incentives and rewards for investments in inventive and creative works. However, intellectual property rights can also be implemented in ways that are overreaching, anticompetitive, and protectionist, harming both economic growth and the interests of consumers. Increasingly, economists, political scientists, business leaders and consumers are recognizing that intellectual property rights are forms of government regulation that have both costs and benefits, and which are also subject to regulatory capture by special interests. Knowledge is the fuel of the modern economy, and trillions of dollars are spent on education and the creation and dissemination of information. We want businesses, consumers and other stakeholders to be informed, and take advantage of the best technologies and to manage knowledge resources wisely. The freedom to use and share knowledge can be seen as the normal case (the general rule), and intellectual property rights as a limited exception (the exception to the rule). As noted in the February 2006 Economic Report of the President, it is difficult to find the right balance between intellectual property rights on the one hand and the freedom to use and share knowledge on the other hand. Some level of intellectual property right protection is clearly necessary to create the incentives and rewards we need to support and reward creative and inventive individuals and communities. But we also very much need systems for creating and disseminating information resources that are not owned or controlled by anyone. The knowledge economy is a complex ecosystem. To support the discovery and development of new medicines, we rely upon a plethora of patent and sui generis methods of intellectual property protection to create incentives to invest in new medicines, but we also spend approximately $30 billion per year through the National Institutes of Health (NIH) on government funded research, much of which freely enters the global knowledge commons. The US government vigorously promotes the patent system globally, but it also provides more global public goods for medical research than any other country. The Human Genome Project, the HapMap Project, Medline, and other public goods are as important to the drug discovery system as are patents and high prices on new medicines. There are trade related aspects of both issues in this knowledge ecosystem. The US government has supported the TRIPS and other multilateral and bilateral trade agreements that seek to address the issue of ensuring that every country provides minimum levels of protection for patents, copyrights and other types of intellectual property protection. These agreements deal with global "free riding" for investments that rely upon patents, copyrights or other types of intellectual property protection. But they do not address free riding issues relating to global public goods, such as costly project like the Human Genome Project or Medline. Nor do these agreements deal with another problem -- the possible anti-competitive and protectionist nature of intellectual property systems that are overly restrictive in terms of access to knowledge. US trade policy lacks balance. It places all of its emphasis on one issue -- the possibility of free riding on investments that are protected by patents, copyrights or other types of intellectual property. It does nothing to address the free riding on public goods, and it is also doing nothing to address cases where inappropriate levels or badly managed intellectual property rights are an unwarranted encroachment on the public domain. There is simply no policy justification for this lack of balance. The reasons for a lack of balance are undoubtedly due to the vast lobbying resources of intellectual property right-owners, who can command the attention and attract the favors of political leaders and civil servants who supervise trade policy. It is also due to a lack of understanding of the importance of freedom and access to knowledge to the processes of innovation and economic growth. Assumptions about the optimal balance between intellectual property rights and the public domain were shattered when the Internet emerged as the new platform for the sharing and distribution of knowledge resources. Everything about the Internet was a surprise. The core technologies for the Internet were either placed in the public domain, or freely licensed to everyone. Enormous attention was given to the benefits of open standards for certain key network and software technologies. The explosion of publishing on the Internet vastly increased the amount of information that was available without charge to anyone. New models for the development of "free software" were key to overcoming anti-competitive tendencies of some companies, and attractive as a superior model for designing, maintaining and enhancing certain services provided by software. Scientists working on medical or agricultural research, and publishers of scholarly journals were deeply influenced by the amazing benefits of these new information technologies, as were venture capitalists and firms both big and small. New business models and new forms of collaboration among different communities of creative and inventive persons emerged overnight to explore and test these new possibilities. Some of this was strictly non-commercial, and some was very commercial. The "free" technologies of the Internet created enormous new private wealth, and vastly enriched the lives of the public at the same time. It is a dynamic and complex ecosystem that undoubtedly has done much to promote trade, investment, innovation, development and growth in other sectors of the economy. Meanwhile, the rhetoric and policy objectives of US trade policy seemed firmly rooted in the past -- and in some cases, hostile to these new paradigms. The Korean FTA is an opportunity to consider new thinking about trade policy. One possibility is to consider a new chapter in the FTA on Access to Knowledge (A2K). The United States is the largest source of public domain knowledge resources in the world, and the world benefits from a number of important limitations and exceptions in US copyright laws. But we also benefit from public goods provided by our trading partners, and the limitations and exceptions in foreign patent and copyright laws that guarantee greater access to their knowledge resources." Education Minister Lord Adonis has announced a series of pilot schemes to test the proposed child information sharing index. He said the results of the trials would inform the design of the huge information system on children proposed under the Children Act. I hope he doesn't mean inform as in the way the ID card trials informed developments on the ID card system. Only ID card anoraks will probably remember how the government set up an ID card trial (a good idea), delayed the start for months due to technical problems, promised they would ensure the full trial would still take place, terminated it early, discovered the technology was ridiculously unreliable, and announced the whole thing was a roaring success, since a majority of the people taking part said they didn't mind the registration process too much. William Heath is concerned at his inefficiency in filling out official forms and where it will lead him in the UK government's brave new world. "I realise that the fact that I loathe form-filling and administrative intrusion generally is not the government's fault, but my own failing, because I'm so damn forgetful and frankly inefficient. It does mean that any malevolent authority would have no trouble at all fining me, locking me up or generally forcing me into line on the basis I'm not conformant to the behaviour they require. Thus they win." Adam Jaffe and Josh Lerner had a nice article in the WSJ last week(unfortunately behind a paywall) on the US patent system. It basically follows the theme of their book, Innovation and Its Discontents, published a couple of years ago by Princeton University Press. The combination of making patents easier to get and simultaneously more potent when enforced has led to an explosion in patent litigation. Holders of dubious patents -- be they established firms or "trolls" whose only business is patent enforcement -- routinely threaten firms that sell valuable products with shutdown based on alleged patent infringement. Even if the target firm believes that it does not infringe, or that the patents at the basis of the claim are invalid, the cost and risk of proving this in court may be too high. Innovators may choose simply to drop the allegedly offending product, or to settle and pay ransom rather than fight." Henry Porter has been waxing lyrical about ID cards again. Blair may decide to invoke the Parliament Act, the machinery that allows the House of Commons to overrule the Lords when the two houses reach an impasse on a bill. My bet is that he will do so, even though deception is involved, because the longer the ID card bill is delayed, the more people become familiar with its hidden purpose. People are beginning to see that ID cards are not being introduced so that they can identify themselves but rather so that the government can identify them and keep track of every important transaction in their lives. It is understood that even if you have nothing to hide, you may still have something to fear from a government that lies about its intentions, to say nothing of the governments that may follow in its authoritarian slipstream." "It's fairly well known that Skype's founders won't come to the US for fear of lawsuits arising out of their part in building Kazaa... but it looks like they may now have another lawsuit on their hands as well. Andy Abramson gets credit for the big scoop of the weekend, discovering that Morpheus maker Streamcast has now sued Skype and its founders Niklas Zennstrom and Janus Friis under RICO laws, which are more commonly used against organized crime groups. It's not all that common for RICO violations to be charged between companies, but it does happen (recently a few times against the recording industry, for example). Abramson has all the details, which Om Malik summarizes as being all about the money -- basically saying that Streamcast is pissed off that Zennstrom didn't sell them the Kazaa technology, before spinning it off to Sharman Networks. Streamcast says that the their own deal included a "right of first refusal" should Zennstrom sell the technology to anyone else. Streamcast also claims that the basic Kazaa technology is part of Skype." Mr Nikesh Arora - Vice President of European Operations, Google UK Ltd.
as well as Brewster Kahle and notable others. Interesting to see Arora in there, as the French lobbied for this in the first place as a kind of EU anti-Google book project. Are we safer in the dark? * Judge makes order saying - 'you must not authorise infringement'. He then says 'you will not be authorising infringement if you put in Filtering Type A or Filtering Type B. Note that both these Acts are aimed at preventing new users from infringing - but are also aimed at preventing existing users from infringing (or at least, reducing infringement by existing users). * Respondent (Sharman) doesn't do Filtering Type A, or B. Instead it does Act C - blocking downloads. That helps to prevent new users from infringing but of course does nothing about existing users (it may eventually drive them away because they won't get upgrades to software of course, but that's a long term kind of effect). Now clearly, in this scenario, Sharman/Kazaa are engaging in one, big game of legal chicken. They've taken a risk that what they've done, less onerous and difficult as it is, will not be contempt. But whether it is contempt is not answered by the Full Federal Court's judgment. They had to make a decision in the absence of full facts about the alleged contempt. 1. Does Sharman cease to authorise infringement of copyright by blocking downloads of the software to Australia? 2. Does the answer to question (1) depend on how effective the blocking is in preventing future infringements? 3. How would you prove contempt in such a case? Could the contempt hearing have to involve a whole lot of evidence about how effective the blocking is? 4. Can any of this really be proved beyond reasonable doubt, as required in a charge of contempt? And note: the answers to these questions - particularly question 1 - are very much dependent on what counts as authorisation. And of course guess what - that is the very matter that is on appeal." The RIAA had always ignored her but then, out of the blue, suddenly wanted a court order to allow it to ferret freely through her hard drive. Andersen and her lawyers, Lybeck Murphy from Mercer Island, Washington, refused to give carte blanche access, and judge Donald Ashmanskas has told Andersen to go ahead and hire her own independent private forensic expert to look for specific files, also ordering the RIAA to foot the bill for the examination." An op ed in the LA Times has critised Marvel and its rival DC comics for enforcing their trademark in the term "super hero". any company wishing to market a comic book, graphic novel or related item with any variation of "super hero" in the name or title must get permission from Marvel and DC. Dan Taylor, the Costa Mesa-based creator of the "Super Hero Happy Hour" comic, learned about this absurdity two years ago when he was contacted by lawyers for Marvel and DC, prompting him to rename his series to the more pedestrian "Hero Happy Hour." Ben Goldacre has been foaming at the mouth about "brain gym" again. "Nothing prepared me for the outpouring of jaw-dropping stupidity that vomited forth from teachers when I wrote about Brain Gym last week. To recap: Brain Gym is an incredibly popular technique, in at least hundreds of British state schools, promoted all over government websites, and with a scientific explanatory framework that is barkingly out to lunch. They teach that there is no water in processed food. They teach that rubbing your ribcage will stimulate the carotid arteries beneath and increase blood to the brain and “activate the brain for an increased flow of electromagnetic energy”. But let’s not leave it with a recap. They promote strange physical origami exercises called “hook-ups” where you press your fingers against each other in odd patterns, because these “connect the electrical circuits in the body, containing and thus focusing both attention and disorganised energy”, as they say in the Brain Gym teaching manual..."
Newsnight producer, Adam Livingstone, has a lovely accessible piece on why Apple are getting so worked up about the bill mandating drm interoperability that was passed by the French parliament last week. "The problem for Apple now though is that there are lots of clever people in eastern lands churning out those 20 pound DVD players who have realised they can do the same trick with MP3 players that work just like iPods, only theirs would be a lot cheaper than 219 pounds plus VAT. Worse still, mobile phones are now packing more processing power than the US space programme and their manufacturers want a piece of the MP3 action too. So how do Apple keep their competitive advantage? Their best answer is something called Digital Rights Management. They sell music online, but it isn't sold in that universal MP3 format so beloved of pirates. iTunes music is only playable under an Apple license, and then only by the person who pays for it. In other words iTunes is 80 per cent of the legal download market but only hardware blessed by Apple can play it. So unless you want to burn it back to the old technology that is the CD, that almost always means an iPod. But iPods don't play the digitally protected formats used by other legal download services, so if you have an iPod and you're law abiding then you're locked into iTunes. It's a virtuous circle for them, but a vicious one for their competitors." 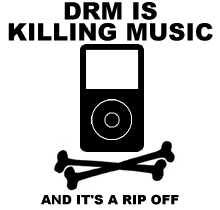 Which is why drm will ultimately fail. Let's see. Should I spend £219 on an iPod that will allow me to buy music from, er, Apple and no one else; or should I spend £20 on another digital music player that does the same as (or probably more than) the iPod, which will allow me to buy digital music from anyone who sells it? I know - you can rip your CDs to the iPod and there are various other ways of getting music for it etc but contrary to what Livingstone says in response to comments, the situation with copying music like this is resolved, in the UK at least. Copying for personal use has long been accepted as 'fair use' in the US, in spite of the RIAA's briefings to the contrary, but UK copyright law does not permit the making of copies for personal use. Such copying is not considered "fair dealing" in the UK. Regarding the CD rippers having the consent of the copyright holder, if a use is fair use, then consent is not required. Fair use and fair dealing unfortunately are really complex concepts in practice, like IP law generally, so it is rarely easy to declare definitely that a particular use of a copyrighted work will be protected by fair use/dealing.